Pacemaker is a portable device which allows you to DJ anywhere. The device has a number of mixing functions and manages to allow you up to 120GB of storage to store all of your music on to. The front of the device is broke in to a couple of sections with the top side being home to the display and the bottom side holds a touch pad which allows you to control functions of the Pacemaker. There are also several buttons around the mid section. The pacemaker has 2 audio channels which allows you to listen to 2 tracks at once or fade in to one track from the other. Beat matching is also possible with this device so you can make a smoother transition. If you don’t have the skills for that then automatic beat matching is also built in. The Pacemaker comes supplied with software which allows you to edit and refine your mixes and then transfer them back to the pacemaker and optionally upload them to the internet to share with other pacemaker users. It provides a DJ set-on-the-go system where you can plug it in to any amp and speakers and just start mixing. Alternatively you can listen on headphones privately. Music is supported in the MP3, M4A (AAC-LC), AIFF, FLAC, WAC, Ogg Vorbis and SND. Up to 15 hours of battery life is also provided although for mixing between tracks you’ll probably get about 6 hours. 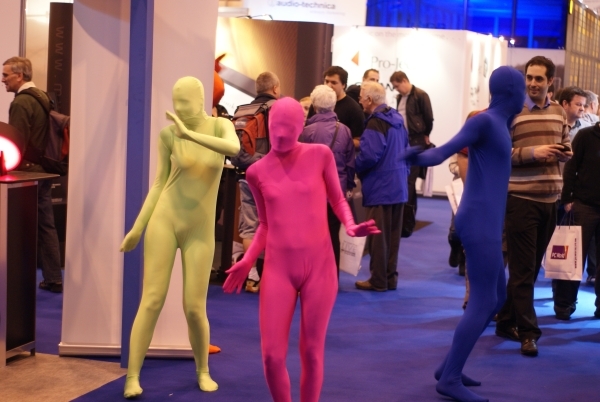 Check out the dancers below who were quite an entertaining part of the booth at Gadget Show Live. Details of Pacemaker are found here.